Your reception to our realtime cardwall had been great! We've been monitoring and studying your usage of the new features and have consolidated the bulk of the comments and feedback into a post-deployment refinement. What is it all about? 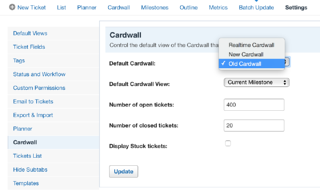 Our original cardwall was our first foray into Kanban planning and included key features that allow you to plan and sort cards based on status. The cardwall was a refresh-only solution and had the basic features needed to get the job done. This cardwall was good because it could fit lots of cards wide and tall - at the expense of shrinking the cards to almost unusable limits - unless you kept getting a bigger monitor! For those of you who still like this view, you can turn it on in the settings. The New Cardwall was launched last year. It updated our styles to reflect a more modern CSS style set, while keeping the refresh-only backend. This was a stepping stone to getting to where we are today: a realtime cardwall. This cardwall followed some of the style patterns of how @trello organized their boards by focusing on horizontal scrolling over shrinking cards to keep it all "on one screen." The Real Time Cardwall brings the best of @reactjs and #websockets to bring a fluid real-time application feel to your browser. You do not need to refresh the screen to keep up to date with your team. Real time is a theme that you will see evolving in Assembla over the next few months as we bring real time planning and UX improvements to our user base. We want to make planning easy, fast, and fluid. More importantly, we want to make it feel "just right." We launched the Real-Time Cardwall on June 5, 2016, and reception has been great. As with any release, our most active users love to comment - and we love your comments! Keep talking to us and helping us make everything better. 25% more space for columns: Better support for those of you who have big Cardwalls with lots of tickets and columns on big screens/kiosks - we made the cards more compact and decreased their minimum width - this should handle small screens, large screens, small cardwalls and large cardwalls alike. When we released the real time cardwall last week, it fit 8 columns (comparatively, Trello fits 7) but our current modification now fits up to 11 columns, all the while retaining the smooth style of the tool. Less clutter: As part of our ongoing evolution of the Assembla look and feel, we removed two artistic layers that were contributing to the "busy"-ness of the cardwalls (borders) - less is more! Your feedback and comments were the driving force behind this refinement. We thank you for them. Our summer goal is to continue to pivot Assembla to focus on our customers. We are working on a UX roadmap including summer treats for you #projectplanners and #agile developers using our task management tools and repositories. Stay tuned for a follow-up blog about our summer plans!